Has saving humanity become routine? 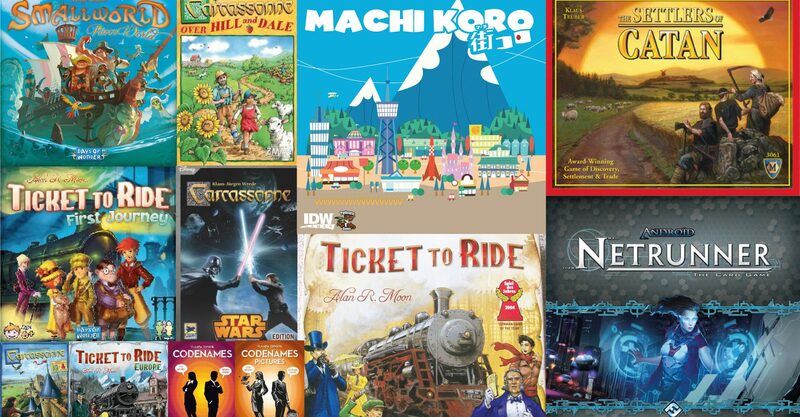 Spice Pandemic up in this expansion with new roles and events. Add a fifth player, try Legendary difficulty, or add an optional challenge. On the Brink addresses the problem of the players drifting into a lull of familiarity with a game which has the potential for a great gaming atmosphere. By adding new roles to play with, your Pandemic team can look different every time instead of just having the same scientist and researcher hanging around. New special event cards also increase variation into the tools you can use throughout the game. Meanwhile, three new scenarios will heighten the threat level of the game’s complexity in a much more interesting way than simply adding in another epidemic card. These three challenges make Pandemic much more interesting, especially for those who are finding a lot of success with the base game. On the Brink is a great little package which adds a lot to an already great game. The three challenges each bring something different. If your gaming group is anything like some of mine have been over the years, there is always one person who doesn’t want to co-operate and in fact likes to cause havoc where they can. Well The Bio-Terrorist challenge is ideal, as one person gets to be the bio-terrorist working against the team, moving in secret. The Virulent Strain challenge means that after the first epidemic, the disease with the most cubes on the board gains an effect. These effects vary, it may be that whenever there is an outbreak of this disease, a 2nd outbreak happens immediately, it may be that some cubes are removed from the off table store, making it more likely this disease will run out of cubes and thus cause you to lose the game. The Mutation Challenge adds a 5th disease, the purple disease. This disease tends to come up after first epidemic but there is a chance of it appearing earlier. This disease has its own effects to add to the complications and only 12 cubes. The new effects for example, many add a cube for every two cubes in a city. Also during the infection phase if you turn up a card which already has a purple cube on it, it gets a purple cube and 1 of the indicated colour. To win you now either have to cure all five diseases, or to have cured the four base diseases and treated all of the purple disease. There are two simple additions from the On the Brink, these are the new role cards and new special event cards. 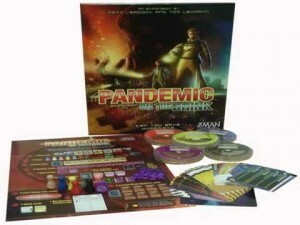 With only five roles in a four player game, Pandemic didn’t really provide enough variety for your team and their special abilities. With the On the Brink expansion, there are eleven roles providing a lot of variety for your team! Along with eight new event cards to add to the variety. This way you can’t tell whether “One Silent Night” or “Airlift” is going to come up which adds for variables to the danger. The expansion also comes with some maintenance add-ons which include smaller pawns which can replace the older pawns and some petri dishes which are used to store the disease cubes. 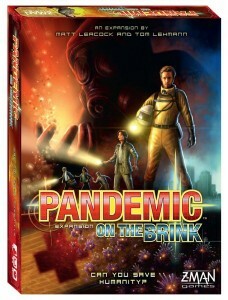 If you have played your fair share of Pandemic games and saved the world a few times already, why not make this game better with the On the Brink expansion! The game can be played for between 2 -5 people and can be played within an average time of 45 minutes. Available Here.